Maybe some of you can still remember the story I've written some time ago, with a little boy and a ginger cat in it. Today I found another pic at ushobwri and I couldn't resist writing a sequel. Please notice that it takes place about three years later. Zeke closed the door behind him, wondering where they could be. Maybe already on the first floor; Jason's bedtime was already past due. Zeke felt disappointment rushing through his body. A last minute customer had messed up his plans to close the garage early today to spend this evening together with his little family. Since he had taken over the garage, he had much less time together with them. Casey and Jason. The guy he was fallen in love into when he had met him first at Highschool. And their son. They had adopted Jason three years ago. The little baby boy with his blonde curls and big green-brown eyes. He had looked so lost, so small and helpless when they had met him first. A foundling, discarded like waste. No one knew about his parents or his birth, but the scars on his small body told volumes. Casey had taken him in his arms, had gently rocked him to calm him down, tears in his eyes. Zeke had been just standing there, unable to move. But while he had watched them suddenly he had known it. Jason was the child they were looking for for quite a while already. It had been a long way with a lot of ups and downs, but they had never regretted it. A giggle finally pointed him in the right direction. The living room. And Jason was still awake. Zeke smiled while he followed the muted noises. So it wouldn't be too late for a warm hug and a good-night-story. Sometimes he felt some kind of irrational jealousy that Casey was working at home and had so much more time together with Jason. But in the evening the boy demanded insistently that Zeke did read his story to him. He entered the living room and stopped dead. 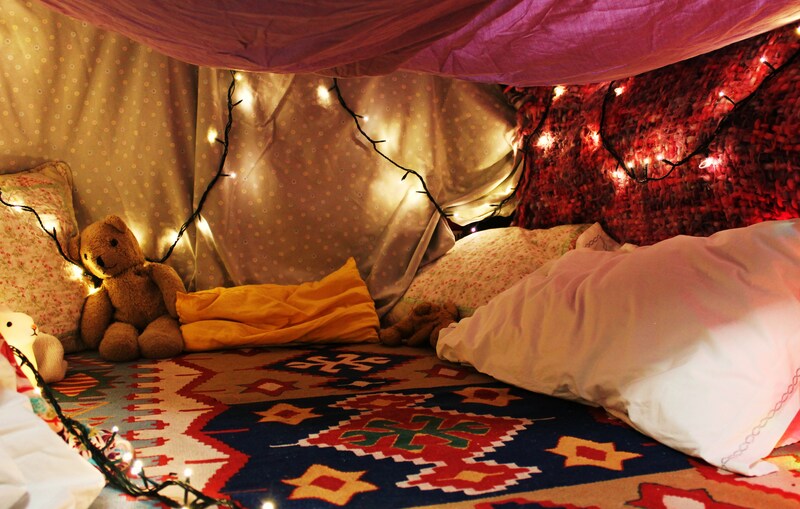 Most of the furniture was moved sidewards to the wall, and the rest of the room was turned into a big fort of cushions and blankets; Zeke hadn't even known that they owned that many blankets. Zeke got on his knees and crawled through the small entrance on all fours, trying hard not to cause the cave to collapse. Surprisingly roomy and pretty comfortable, he had to admit. More cushions and blankets and the old, thick carpet from the guestroom on the floor. Casey had unpacked the Christmas lights again and had hung them up at the blanket walls. Teddy and Bibo, Jason's beloved stuffed animals were sitting in a corner side by side. Bella was sleeping curled up near Jason. No way that the ginger cat would leave the boy alone; from the very first day she had been Jason's best companion. A box of chocolate and a can of soda told that father and son obviously had been on a sugar trip. Casey shrugged apologizing when he noticed Zeke's look. „It's an exception,“ he said. Zeke bent forward to place a kiss on Casey's lips. „Fine by me,“ he laughed and pulled Jason into his arms. He tickled him slightly. The boy laughed and put his arms around Zeke's neck. „Daddy says Bella, and I can sleep in my fort tonight,“ he told him. Zeke looked around in the cushion fort; it was big enough for Jason to sleep here, but not for him. Difficult to say no, though, when he looked into these hilarious sparkling eyes. „This is a brilliant idea,“ Casey dropped in. Jason beamed, and Casey bent forward to whisper in Zeke's ear. I'm glad you like. It's so much fun to right this universe.